Portable Antiquity Collecting and Heritage Issues: Sotheby's: Where is the Paperwork? According to the Ministry of Culture, stolen ancient artifacts illegally left Peru and are now on auction in Sotheby’s in the United States, reports El Comercio. Sotheby’s sold eight of the items on May 15. The Ministry of Culture has so far confirmed that 10 of the 13 items are original pieces. The Peruvian Ministry of Culture confirmed yesterday that the artifacts left Peru illegally and 10 of them are confirmed authentic pieces. However, they have no concrete evidence to present. 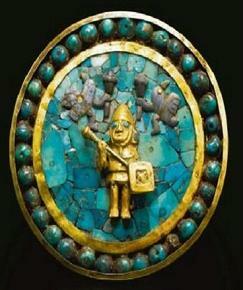 The artifacts are believed to be from cultures Sicán- Lambayeque, Moche, Paracas, Wari and Chancay. Of the eight sold items, five are gold and belong to the Sicán- Lambayeque culture and the other three are Moche, Chancay and Wari, reports El Comercio. The five items still on auction appear on Sotheby’s online catalog as three Paracas ceramics pieces, a Moche ear piece (photo above) and a spear of gold from Sicán- Lambayeque. [...] The general director of the Defense Ministry of Cultural Heritage, Blanca Alva, told El Comercio that it is difficult to initiate a repatriation process as no documents exist to prove their claims. And the US authorities... ?